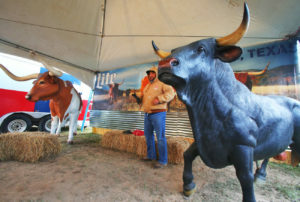 DONNA — Although Saturday’s cold and relentless drizzle put a damper on the annual Chisholm Trail Festival here, local organizers and participants of the barbecue competition did not let the weather rain on their proud event. At the onset of the day’s festivities, with few spectators on-hand, appeared as though the festival may be in for a long day. However, performers scheduled for that evening’s concert still expected to draw a significant crowd as of press time. The festival, which is usually a two-day event, shrunk to a single-day for 2019. Event coordinator David De los Rios said this year’s focus on Tejano music was designed to draw 8,000 to 9,000 people throughout the day. Numbers for the day’s attendees were not available before press time. The Chisholm Trail was the major route for livestock out of Texas from 1867 to 1884. Longhorn cattle trekked the trail north, providing a steady income for locals during the recovery from the Civil War. Jesse Chisholm, the trail’s namesake, was an Indian trader who was the first to lead cattle from Texas ranches to Kansas railroads. 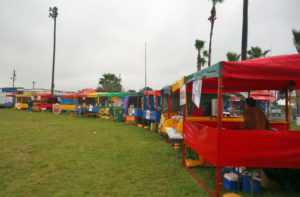 Aside from the live Tejano music from country bands, including Space Rockers and Los Palominos, and singers Marco Orozco and Pio Treviño, competitors looked forward to the annual barbecue cook-off that was held at Donna’s Parks and Recreation center. Eddie Tapia, International Barbeque Cookers Association judge of 12 years, says that he is always delighted when food brings families together, specifically barbecue. This year, 28 teams competed in the cook-off. The competition was divided into three categories: chicken, pork spare ribs and brisket. Ten winners for each category were awarded and $1,000 is divided amongst the top five. One of those resilient cooks was Juan Ramirez of Ram’s Bar B Que in La Feria. Palomarez says that the key lies in preparation. “ You make sure that you have everything ready, so you are not caught in the rush,” Ramirez said, who has worked the grill for 10 years. 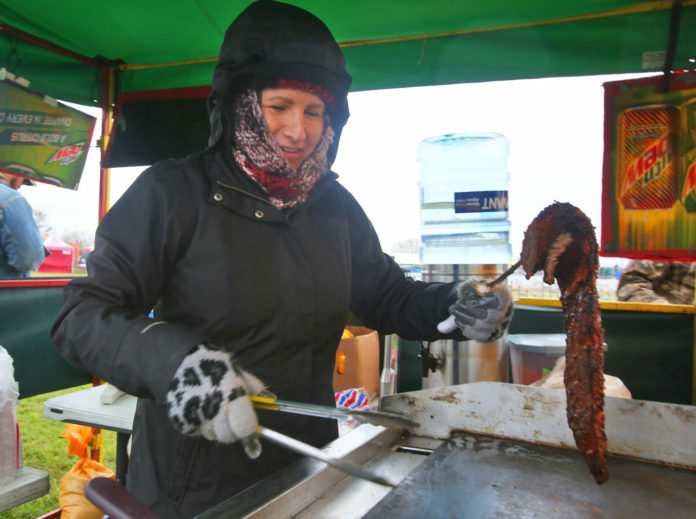 At 8 p.m. Friday night, Ramirez was preparing the seven whole briskets they brought to the event with restaurant owner Juan Palomarez. The meat then spent 12 hours smoking. This is the second year Ram’s Bar B Que has cooked at the festival and Palomarez said that he is glad that commemoration includes barbecue.